Includes: 1.5 Quart and 2 Quart Covered Saucepans, 5 Quart Covered Dutch Oven, 8 Inch and 10 Inch Skillets, four Prestige kitchen tools including a Solid Spoon, Slotted Spoon, Slotted Turner and Pasta Fork. 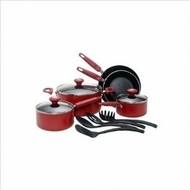 Durable nonstick interior provides easy cleaning and fat free cooking. Comfortable, dual riveted rubberized handles offer a secure grip. Oven safe to 350°F. Sleek, colorful exterior creates a pleasant stovetop display. Dishwasher safe. Tempered glass lids let you want food cook while trapping flavor and nutrients.